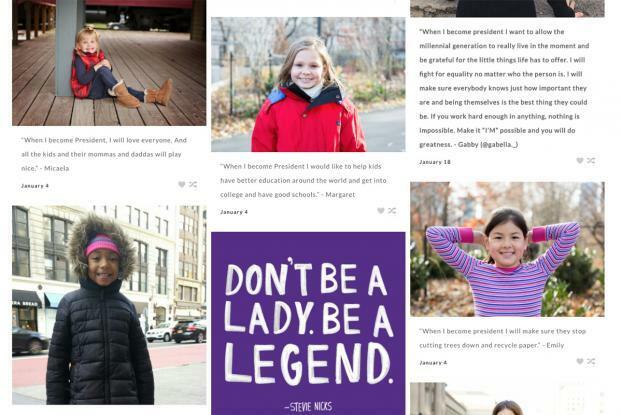 After the U.S. election, McCann New York staffers Katie Henry and Ashley Glass paired up on a side project to inspire girls to be leaders. They called it "The When Project." As their website says, "We'll inform the world that a female U.S. president is not a matter of 'if' but 'when.' And inspire girls across America to believe it will be them." Ms. Henry, an integrated producer/photographer, and Ms. Glass, a senior copywriter, have spent weekends approaching parents on the street and asking to chat with their girls about their White House ambitions. (Fellow McCann staffers Danielle Wasserman and Stephanie DeJesus also worked on the personal project.) The team took an empowering photo of each girl and paired it with her answer, a la Humans of New York. They also have encouraged submissions from girls via social media. Girls imagined themselves using America's top job to protect pets, improve education or build homes for people who don't have them. Or as one girl said, "When I become president I will probably get a dog first of all. Eat lots of ice cream. And decorate the office with glitter." "Just having a girl stop and think about holding the highest position in the world - even for 5 minutes - is a win," Ms. Henry told McCann's Truth Well Brewed blog. " It plants a seed."